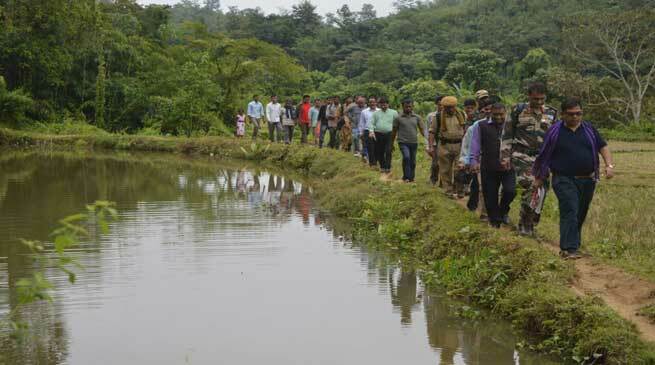 With a view to removing the sense of alienation and to bring the administration closer to the people, Hailakandi Deputy Commissioner Moloy Bora has embarked on a mass contact programme crisscrossing the district focusing on the inaccessible and far-flung areas. Making whirlwind tours in different parts of the district, Deputy Commissioner Bora set off in the wee hours on Friday with Superintendent of Police, Pranab Jyoti Goswami in tow, to Riflemara, a nondescript hamlet, 13 kms deep inside dense forests, close to Assam-Mizoram border. Trudging along for close to three hours – negotiating undulating and inhospitable terrain, rickety bamboo and log bridges, crossing over the Dholeswar river by boat and a long precarious suspended bamboo bridge over river Balunala, DC Bora and SP Goswami reached at long last Riflemara, a small hamlet of Riang community concentration, after a brief stopover at Arjunfa Para camp. A rousing traditional welcome was accorded by the villagers of Riflemara to the visiting officials and dignitaries with village headman Tilok Ram Riang leading from the front. Flower petals were sprinkled with young damsels clad in colourful ethnic attire dancing in gay abandon to the accompaniment of drums and cymbals, escorting the officials all the way from the main gate to the village perched on hillocks. People were ecstatic. And the reason was not far to seek: they did not witness ever before the coming together of two heads of the district to their village. Only Deputy Commissioner named S.Thiek had come to their village in 2012. Thiek was DC Hailakandi from January 9, 2012 to February 2, 2013. The young and old alike who had assembled since early morning braving the cold exuded the optimism that things will change for the better and they will enjoy the fruits of development that have eluded them since long. Interacting with the villagers, Deputy Commissioner Bora explained to them that his sole purpose of coming to the backward village is to get first-hand account of the problems confronting them and how to redress their grievances. “I have come here with the purpose of having hands-on experience of the live issues of the people and to find ways how to resolve your genuine problems. This outreach programme gives me a massive opportunity to directly witness a wide range of problems faced by the masses,” he said, adding that he had learnt a lot during his interface with people. Lauding the efforts of Deputy Commissioner Bora to connect with the people through mass contact programme, SP Goswami said it will go a long way in bridging the gap between the people and administration. He firmly believed that the mass contact programme has been able to take the administration to the midst of the people and help to wean away the misguided youth from the path of violence. “Extremism will die down if the socio-economic issues fueling it are effectively addressed. And the best way to tackle extremism is to build bridges of understanding through mass contact programme,” he added. Scores of people who thronged the venue to meet the Deputy Commissioner handed over petitions seeking his intervention to end their cup of woes brimming over. Village headman Riang, who handed over a memorandum with several signatories, enlisting some genuine and long-felt demands said, “What we want is solving of the burning problems being faced by us such as lack of road communication, health, education and drinking water. These are basic and fundamental rights that we have been deprived since long. And we are not asking for more,” he said. Riflemara was founded by headman Chandra Moni Reang in 1964. A memorial has been built in his honour. There is no Government School here. An LP School is being run by an NGO, Kalyan Ashram. Paying floral tribute at the memorial, Deputy Commissioner Bora pointed out that his avowed mission is to bring awareness among the people, especially those living in far-flung areas, that ‘the administration is with them and wants to reach out to the underprivileged and marginalized sections so that they can reap the fruits of development’. Village headman Riang said the goodwill gesture by the district administration to reach out to them will herald good days for them in the near future. Bora assured the villagers that the administration would leave no stone unturned to bring ‘acche din’ in the days ahead. The Deputy Commissioner narrated that things have started changing at ground zero with the coming to power of a new dispensation in Dispur with priorities being accorded to development of backward areas, including border area development. The Deputy Commissioner was quick to add that the development initiatives would be in consonance with the existing forest laws and norms. Riflemara and adjoining villages fall under the Inner line Reserve Forest. Bora, who completed one year in office on October 9 this year, said his priority will be to complete the unfinished tasks vis-à-vis hanging in the balance since long, without impacting the environment. “I will have discussions with Divisional Forest Officer, D. Biswas present here and also at the appropriate level as to how to go about in initiating the development process with disturbing the ecological balance. Towards this end, I seek your support and cooperation as problems cannot be solved in isolation but through combined and concerted efforts,” he added. As the southern tip of Hailakandi district is plagued with extremist problem – two extremist groups are operating here – Riflemara and adjoining villages fall under it – Deputy Commissioner Bora urged the village headman and elderly to persuade the misguided youth to eschew violence and return to the mainstream with the promise to rehabilitate them into the mainstream. Underscoring the need for spreading the light of knowledge, Bora appealed to the village headman and elderly to prevail upon the parents to send their wards to educational institutions. “You must insist on the parents to send their children to schools. The drop-outs too must continue with their studies,” he said adding that the administration would focus on trimming the number of school drop-outs. As villagers’ lodged complaints following demonetization of Rs 500 and Rs 1000 currency notes and with no nearest bank around, the Deputy Commissioner assured them that he would take up the matter with the bank authorities and request them to collect the invalid currencies from the village itself and transfer the same to their accounts. As part of the mass contact programme, a medical camp was organized jointly by the district administration and Assam Rifles, drawing hordes. Eight doctors, two ANM nurses and five ASHA workers from the Office of Joint Director, Health and Family Welfare, Hailakandi and five from Assam Rifles pitched in their efforts to provide the best of treatment to those suffering from anemia, dental, gynecological, pediatric and other ailments. A special immunization drive for children was also carried out. Over 600 patients enrolled their names – quite a good turnout considering the fact that the village has a population of around 5,000 only. In the wake of good response and the growing demand from the people of Riflemara for more health camps, Deputy Commissioner Bora assured that the administration would organize such camps from time to time, drawing loud cheers from the gathering. As the DC and the SP started off on their return journey, with thousands of villagers of Riflemara giving them a warm send-off, a new ray of light has descended igniting hopes aplenty.